I made a little frenchie! It is much smaller than it looks, maybe about 2 inches tall? My cousin wanted a key chain for Christmas, and she loves French bulldogs! Like my other small things, I have split embroidery thread in half! It takes a lot of patience, but it pays off. This one probably took me about 10 hours to make, (maybe longer?) But was done over the course of a month or so. I have been gone for quite a while, and Im finally back! I figured I would share some of what I have made in the last year! Here I have pictures of a bunny, small kittens, a mallard duck, two dogs, a little flamingo, as well as the giraffe I finished earlier today! I have made many many more things in the last year, but I think these are my most notable! These are my crochet patterns with the African Flower! What I love most about them is that you can make a few flowers without needing to look at the pattern all the time. They are so easy and fund to make and after you have done a few you put them together and create magic! 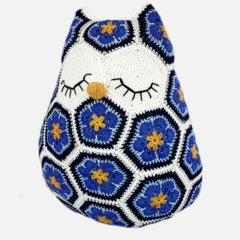 Etsy: Owl: https://www.etsy.com/listing/153654228/crochet-pattern-maggie-the-african?ref=listing-shop-header-1 Dog: https://www.etsy.com/listing/160079111/crochet-pattern-mia-the-african-flower?ref=shop_home_feat Skull: https://www.etsy.com/listing/158469308/crochet-pattern-lucy-the-african-flower?ref=shop_home_feat Butterfly: https://www.etsy.com/listing/154920384/crochet-pattern-tess-the-african-flower?ref=related-5 Heart: https://www.etsy.com/listing/159318990/crochet-pattern-african-flower-heart?ref=related-7 Ravelry: Owl: http://www.ravelry.com/patterns/library/maggie-the-african-flower-owl-pillow-pattern Dog: http://www.ravelry.com/patterns/library/mia-the-african-flower-dog-pillow Skull: http://www.ravelry.com/patterns/library/lucy-the-african-flower-skull---crochet-pattern Butterfly: http://www.ravelry.com/patterns/library/tess-the-african-flower-butterfly-pillow---crochet-pattern Heart: http://www.ravelry.com/patterns/library/african-flower-heart-pillow Here is the link to my craftsy homepage: http://www.craftsy.com/user/1580275/pattern-store?_ct=fhevybu-ikrdql-fqjjuhdijehu Please tell me what you think of my patterns! I would love to pick your brain:) Have a great day all Crochet Nerds like me! Kibbles is my hook's interpretation of a Boston Terrier mix dripping all the eager sweetness of a happy pup from the Local Pound who's ready to jump all over you and lick your face with joy because you adopted him into a loving home. You will find the free pattern here: http://funmigurumiandkidsstuff.blogspot.com/2013/01/funmigurumi-mookie-tookie-kibbles-dog.html#.UO0It-Thot0 Enjoy! Sharing my free dog leggings pattern for anyone who may need these for their dog to stop licking their legs. Kinda like dog socks without the foot part. Hi, I have a new pattern inspired by a real life pet dog, Dachshund Amigurumi This makes a nice little gift that can be finished in a few hours. Samples shown are 3 inches tall.